Products Home Products Video Communications RealPresence Medialign Dual 55"
Logitel code: RealPresence Medialign Dual 55"
Manufacturer code: RealPresence Medialign Dual 55"
Organizations need more agile and effective team collaboration solutions. The desire to meet quickly with teammates near and far, share ideas, and collaborate on critical projects has fueled the demand for all-in-one visual collaboration. To meet this growing demand, organizations seek turnkey solutions that can be easily and consistently deployed without costly room remediation. Polycom RealPresence Medialign solutions deliver the industry’s best video collaboration with an innovative, modern collaboration and design that deploys anywhere in minutes. Every detail has been addressed to ensure your teams can focus completely on effective collaboration. Polycom RealPresence Medialign includes everything you need to get started with video communications today. Share thoughts and ideas seamlessly on a virtual whiteboard with Polycom VisualBoard technology. See your team’s reactions in stunning 1080p60 high-definition video and easily screenshare and annotate content with your laptop or mobile device. Create the perfect system for medium to large rooms with packages available in single or dual high-definition display sizes of 55" or 70". Unmatched user experience - Hands-free camera operation, simple touch interface control and audio innovations eliminate distractions for more effective meetings and team collaboration. Integrate into broadest array of UC networks - Open, standards-based interoperability and native integration into UC deployments including Microsoft Lync / Skype for Business and Broadsoft One, Medialign protects your investment from shifting business landscapes. Straightforward global deployment - All in one package provides everything from cables to displays to expand video collaboration to every location. High-definition video conferencing - Experience meetings with lifelike color and detail at lower bandwidths so you clearly see critical facial expression and read subtle body language without clogging your network. Low total cost of ownership - Accessible components makes Polycom RealPresence Medialign easy to service in the field. Fits into any room environment with unobtrusive modern collaboration and a slim line design that adds contemporary influence to your workspace. RealPresence Medialign is the easiest team collaboration solution to deploy without the need of tools or technical knowledge for installation. These all-in-one centers create consistency within your organization while allowing you to choose the proper size for each specific room. By eliminating the need for construction and easily accessible components, Medialign provides the lowest total cost of ownership for video collaboration & conferencing equipment. RealPresence Touch is a touch interface that makes it simple and easy to join and manage video calls. Polycom EagleEye IV (included with EagleEye Producer) is a completely digital camera capturing incredible detail, and offering industry-leading flexibility for any room environment when it comes to video conferencing equipment. EagleEye Producer (standard on all 55” and single 70” packages) uses innovative facial-tracking to instantly recognize everyone in the room and frame them all properly for greater impact, even as participants enter, leave or stand to present. Plus it counts and records the number of participants in each meeting so you can measure the full impact of your video collaboration investment with detailed analytics. 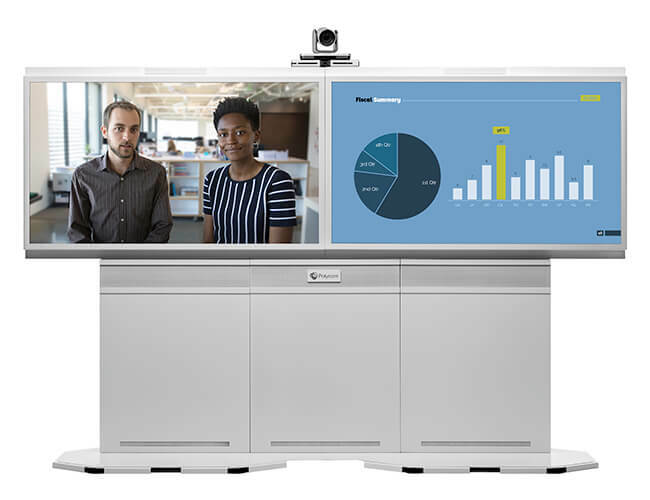 EagleEye Director II (standard on all dual 70” packages) automatically zooms in on the person speaking, transmitting facial expressions and body language for higher impact and more productive video and team collaboration. EagleEye Director II includes EagleEye IV cameras. Polycom Microphone Array provides 360 degree coverage of high fidelity audio to the far end participants. 1080p license provides 1080p people and content resolution to share video clips, CAD animations, medical diagrams, or anything else you can dream up in high resolution. Native interoperability with Skype for Business/Lync extends the benefits of your UC platform investment while simplifying the experience for users with included Lync interoperability license (RTV license). Single and dual high-definition LED display packages are available in 55″ or 70″ for an ideal viewing experience. Modern slim line stand adds contemporary influence to your meeting rooms. High-fidelity loudspeakers provide room-filling audio so everyone can hear without straining. Polycom Ceiling Microphones can be added to pick up voices in a 360-degree area, giving focus to the active speaker without physical intervention and support Acoustic Fence.